Sometimes kids just need kid-sized stuff. Kid-sized food, kid-sized clothes, and even kid-sized furniture. 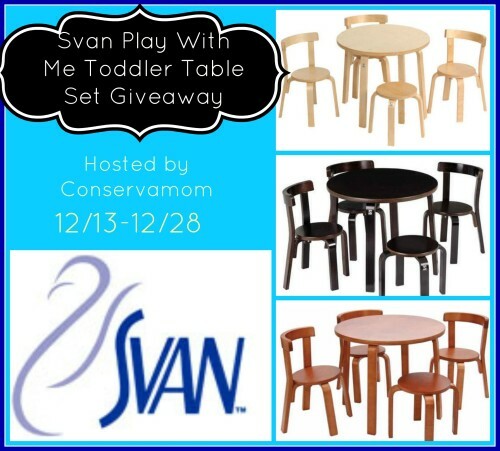 Svan’s Play-With-Me Toddler Table & Chairs is the perfect size for your child, and designed to promote child and parent interaction. The set includes a beautiful bentwood table, three chairs for children, and a stool sturdy enough for Mom or Dad to join the fun. Crafted of high-quality, solid birch wood, this table set is built to stand the tests of time and kid use – art projects, tea parties, games, and other activities. Its modern Scandinavian design complements any décor – from a bedroom or playroom to the living room or home office. This set is the perfect addition to any kids furniture collection. To find out more about this gorgeous set you can check out Conservamoms review here.